Process design space and control strategy are two fundamental elements of quality by design (QbD) that must be established as part of biopharmaceutical development and regulatory filings. Like all of QbD, they are interconnected and iterative. Both are based on knowledge gained during product and process development — but both need to be in place (in a potentially very limited form) when a company begins to manufacture drug substance for clinical trials. Part 1 of this discussion appears on pages 28–35 of BPI’s June 2016 issue. It provides an overview of QbD for establishing the foundations for process development. Parameters and variables that are contained within a design space are determined by criticality assessment of quality attributes and process parameters (2). A design space describes the ranges in which a given biomanufacturing process must operate to ensure product quality. Using a design space facilitates continuous improvement and innovation by allowing a certain level of variation in a process to account for and correct variability caused by process inputs. Design Space Modeling: A process design space is expressed by ranges in which parameters for each unit operation must be maintained to assure product quality. A design space may be defined for an entire process or for a single unit operation (3). Combining several unit operations in a single design space may be more complex to develop, but it can provide for greater manufacturing flexibility. Establishing such a design space for multiple unit operations requires enhanced understanding of the relationships among processes to enable control of their overall impact on critical quality attributes (CQAs). When more than one unit operation affects a given CQA, as is often the case with monoclonal antibody (MAb) processes, the overlapping ranges of individual parameters for each step will put constraints on the design space for the overall process. Because parameters that influence process performance often interact and relate to each other nonlinearly, their relationships can be complex. Therefore, to properly visualize the relationships among multiple process parameters in relation to a particular CQA, process developers often use a three-dimensional graph. Figure 1 shows the design space for a hydrophobic-interaction chromatography (HIC) purification step in the downstream processing of an Fc fusion protein. For this unit operation, process characterization studies show that protein loading and hydrophobicity of the chromatography media each influence the high–molecular-weight (HMW) content of the final product. Because the level of HMW contaminants in the final product is a CQA in this case, both process parameters were identified as critical process parameters (CPPs) (4). Although not a CQA, process yield is an important process performance attribute related to economic feasibility of a MAb process. Figure 1 illustrates the influence of those two CPPs (protein loading and chromatography media hydrophobicity) on the final HMW content of the Fc fusion protein and its overall process yield. Any combination of protein load and column media hydrophobicity outside the blue triangle in the lower right corner of the graph leads to an acceptable yield of the Fc fusion protein. But any combination of both CPPs below the red area in Figure 1 yields an acceptable HMW content. 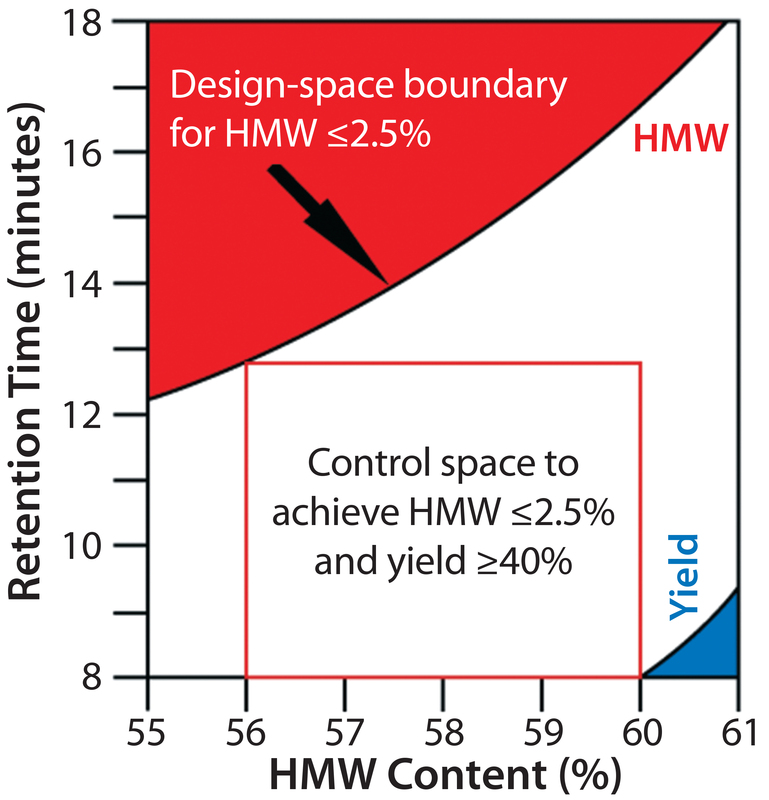 By mapping the effects of protein load and column media hydrophobicity on yield and HMW content in a single graph, this process design space can be defined as the area below the red section of the figure but above the blue section. Combinations of both parameters falling into the white area all control HMW content to ≤2.5% while achieving a process yield ≥40%. Development of biomanufacturing processes involves identification, exploration, and optimization (and eventual specification) of multiple operating parameters. A process risk assessment (PRA) identifies the operating parameters (inputs) for each process step that, if varied, have the potential to affect a CQA: e.g., cell density and integrated cell viability for an upstream process or load temperature, load pH, and load conductivity for a column chromatography step. PRA is generally carried out using either failure mode and effects analysis (FMEA) or failure modes effects and criticality analysis (FMECA) (5, 6). In PRA, a company will evaluate each operating parameter (among process, equipment, and input materials) to determine the effect of a failure to control that parameter on both process and product (severity), the likelihood of such a failure (occurrence), and whether that failure would be detected (detection) (1). A score is assigned to each operating parameter for each category, and the resulting numbers are multiplied to calculate a risk priority number (RPN) (5). The severity score measures the level of harm to patients should failure occur, based on prior-knowledge elements. Occurrence and detection scores measure the likelihood of an excursion (deviation) from the proposed operating range and the likelihood of detecting that excursion in time to prevent safety and/or efficacy consequences (1, 7). Based on the RPN, parameters are classified as potentially critical or noncritical and will be examined further in process characterization studies. Selection of operating parameters and their associated acceptable ranges is based on what is required to adequately control a biomanufacturing process — and thus product quality. This requires careful scientific analysis of all parameters and their effects on both process performance and product attributes. Such analysis often is performed in conjunction with experimentation using a scale-down model of the bioprocess and a “design of experiments” (DoE) approach to evaluating the effect of its parameters in a statistically meaningful way. Developing a design space includes setting specifications for in-process, drug substance, and drug product attributes. Specifications are “a list of tests, references to analytical procedures, and appropriate acceptance criteria which are numerical limits, ranges, or other criteria for the tests described” (8). They establish “the set of criteria to which a drug substance, drug product or materials at other stages of its manufacture should conform to be considered acceptable for its intended use” (8). Specifications are set based on elements that link CQAs to product safety and efficacy using published literature, relevant platform knowledge, and available clinical/nonclinical experience. Figure 2: Specifications are based on elements that link a product’s critical quality attributes (CQAs) to its safety and efficacy. Developing specifications involves information from the published literature, related product and process platform knowledge, specific process data generated during discovery and early process development, and available clinical experience. DP = drug product; DS = drug substance. Global regulatory agencies require the establishment of “scientifically sound specifications” that assure that components, drug-product containers, in-process materials, labeling, and drug products meet standards of identity, strength, quality, and purity (8, 9). Tests and acceptance criteria for appearance, identity, purity/impurities, potency, and quantity all make up specifications, as Figure 2 shows (10). Specifications should be updated over the course of a product lifecycle, particularly when product or process knowledge changes. Conducting process characterization studies is a key step in defining a design space. These studies examine the deliberate variation of parameters identified as potentially critical in PRA to determine the acceptable limits of variation. Process characterization determines process robustness, the ability of a bioprocess to deliver acceptable quality and performance and tolerate variability in inputs (11, 12). These studies lead to the classification of process parameters as either critical or noncritical. That distinction will determine which process parameters will be categorized as critical process parameters (CPPs) and will be included in the design space for eventual control by a control strategy. CPPs are defined as process parameters whose variability affects CQAs and therefore must be controlled (1). In some cases, companies might need to further categorize process parameters beyond critical and noncritical. In these instances, key process parameters (KPPs) can be identified as those that affect process performance, but not product quality. ICH guidelines do not define KPPs, so their definitions are established at the discretion of individual organizations (13). It is important to note, however, that the US Food and Drug Administration (FDA) and European Medicines Agency (EMA) both accept the use of process parameter classifications beyond critical and noncritical only in the “Pharmaceutical Development” section of a regulatory filing, but not in “Description of the Manufacturing Process and Process Controls” or “Control of Critical Steps and Intermediates” sections (14). Figure 3: Relationship of process characterization studies to design space; process characterization studies examine the parameters identified as potentially critical by process risk analysis (PRA) to determine the acceptable amount of variability that can be tolerated in a process, which results in the setting of the characterization, acceptable, and operating ranges. Process characterization studies help a company establish the characterization range, acceptable range, and operating range for each process parameter (Figure 3). The operating range for a given parameter is the range within which a bioprocess will run during normal operations and that has been shown to reliably and reproducibly deliver a product that meets desired specifications. The acceptable range is wider than the operating range and defines the range for a parameter that has been shown to have no effect on product quality. The even wider characterization range is that to which an operating parameter has been evaluated. Process characterization studies typically examine a wider range than the operating and acceptable ranges for each parameter to determine the effects of process excursions, which may occur outside normal operating ranges during routine product manufacturing (15). The ranges established through process characterization contribute to defining a bioprocess design space. Risk assessment, scale-down models, and DoE studies all are key tools in understanding how a process will respond to variability of individual operating parameters and help operators establish how that variability can be controlled. Equation 1: The process capability formula is used to determine the reproducibility and consistency of a biomanufacturing process. 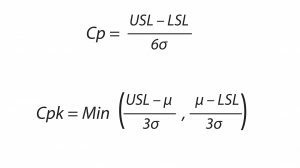 USL and LSL represents the upper and lower specification limits, respectively, for bioprocess output; σ represents the standard deviation of the process specification mean. Equation 2: The process capability index measures how close a bioprocess is to its target specification and evaluates process consistency. Cpk represents the acceptable variation of the process, σ represents the standard deviation of the process specification mean, and μ is the estimated mean of the process. Evaluation of process robustness is a key element in defining a design space. Process robustness is “the ability of a process to demonstrate acceptable quality and performance and tolerate variability in inputs at the same time” (11). Process capability indices are widely used throughout a number of industries and can be particularly useful for antibody development. Process capability (Cp) compares the output of an in-control process with specification limits by using capability indices. Such a comparison is made by forming a ratio of the spread between process specifications (the “specification width”) to the spread of the process values as measured by six process standard deviation units (the “process width”). Cp measures the reproducibility and consistency of a biomanufacturing process and represents its ability to deliver a product within defined specifications. In other words, Cp is a statistical measure of the inherent variability of a quality attribute. 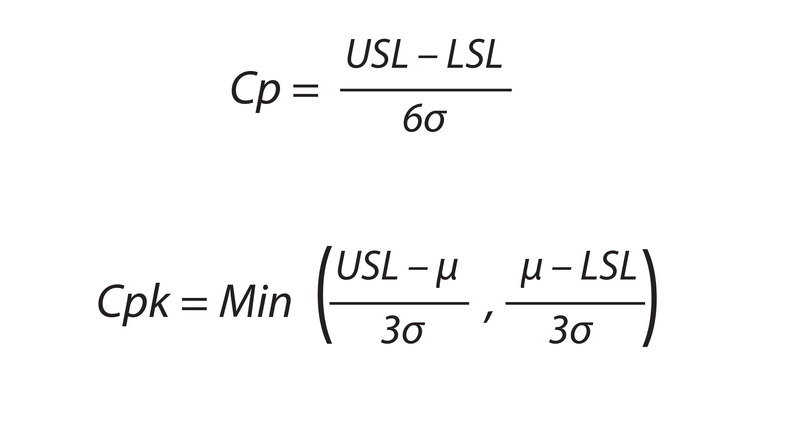 As Equation 1 shows, it is defined as the upper specification limit (USL) minus the lower specification limit (LSL), divided by six times the standard deviation (10, 16, 17). A process is considered to be capable of delivering a product that meets specifications if Cp > 1.33 (17). In Equation 1, it is assumed that the process mean is centered between the specification limits. If the process mean is not centered thusly, then Cp will overestimate the process capability. The variability of a bioprocess can be determined by calculating its process capability index (Cpk), which is defined as “the value of the tolerance specified for a particular characteristic divided by the process capability” (16). This index measures the relationship between process specifications and process performance, providing a measure of how close a manufactured product is to its target specifications and how consistently the process will deliver those results. Defined in Equation 2, Cpk represents the amount by which a process can vary without going out of specification, taking into consideration that the process mean may not be centered between the specification limits. As with the Cp, when Cpk > 1.33, a specific process is considered to be capable; if it is <1.00, further action is required to reduce variability (16, 17). It is possible to have little variation with a high Cp value, but not be on target with a low Cpk value. Therefore, a combination of Cp and Cpk should be used for process characterization studies. Cp assessment illuminates the ability of a process to stay within specification and thus can contribute to defining a design space. Design of Experiments: DoE studies are statistical multivariate studies. They enhance process knowledge by evaluating interactions among process parameters identified by PRA and CQAs identified by an initial quality attribute criticality assessment. These studies can help determine the range in which operating parameter variation has no impact on product quality. DoE can be used to design worst-case studies for evaluating process robustness (11). DoE studies typically are analyzed using statistical software such as SAS Institute’s JMP program, which allows the analysis of multifactor spaces (12, 15). A process design space should lead to a greater understanding of all variables that influence CQAs and how they come together (2). The design space includes inputs and process-parameter ranges, which define the space in which a bioprocess must operate to ensure that product will be high quality. Relationships between CQAs and CPPs are defined by a design space, which specifies the acceptable ranges and operating ranges for all included CPPs. Design space is aligned with an acceptable range outside the operating space, which is aligned with an operating range. Design space may be defined for an entire process or a single unit operation (3, 7). Development of a design space should begin early in product/process development, ideally alongside the conceptualization of a MAb. The design space will evolve over the course of a product’s lifecycle. During initial production of materials for filing an investigational new drug (IND) application, potentially limited development data may be all that are available to define a design space. For a MAb produced using only an existing existing platform process, the design space may be less well defined. Following process characterization studies, however, the design space will become increasingly more defined as product knowledge evolves. Examples of Defining a Design Space: Design space is established for all processes, both upstream (production) and downstream (processing). Application of QbD principles to biopharmaceutical products is well documented. The following examples described how PRA, scale-down models, and process characterization studies can be used to define a design space. Feed 2 rates during adaption and production. With the exception of agitation, scale-dependent operational control set points were scaled down linearly. Process outputs from the scale-down model were observed to be within ranges seen at pilot scale. DoE was used to design studies that would provide data useful for defining the design space. Because of the high number of parameters involved, three studies were designed: OD and feed-rate screening, culture parameters, and protein stability (12). Following execution of those studies, JMP analysis was used to determine criticality of the studied parameters, which contributed to defining a design space. In this study, no variables in fermentation were found to affect final-product quality, resulting in none being defined as critical and allowed for a broad design space (12, 18). Illustrating how design space is defined for downstream processes, Jiang et al. describe how they define the design space for HIC purification of an Fc fusion protein (15). Developing an understanding of how raw materials can affect the process is an important aspect of this study because chromatography resin is a crucial raw material with the potential for variability in biopharmaceutical purification (15). This study involved an Fc fusion protein expressed by a Chinese hamster ovary (CHO) cell line and used a scale-down HIC column. Evaluation of HMW aggregate content was performed using size-exclusion chromatography (SEC). Host-cell proteins (HCPs) were quantified using an enzyme-linked immunosorbent assay (ELISA). In the study, HIC was used as a polishing step in the downstream process to reduce HCP levels. Retention times of lysozyme on the different lots of HIC resin varied significantly. A PRA was conducted using FMEA, with severity ranked on a scale of 1–5, occurrence on a scale of 1–3, and detection on a scale of 1–3. The overall scale for this risk assessment was 1–45. Parameters with an RPN of ≥8 were selected for process characterization studies. DoE was used to design the process characterization studies, and JMP software was used for data analysis, which identified protein loading and resin hydrophobicity as CPPs (15). The concept of a control strategy is not new in biopharmaceutical process development. Whether developed/designed using QbD or not, the manufacturing process for every MAb must have an adequate control strategy that is designed to ensure product quality and control product and process variability (19). Under certain circumstances, it may be desirable to use a hybrid approach to development — that is, to use a combination of traditional control strategy elements and QbD control strategy elements for particular CQAs (2). Doing so can reduce the cost of development but may have the unintended consequence of limiting the benefits typically attainable with QbD. A QbD control strategy is “a planned set of controls, derived from current product and process understanding that assures process performance and product quality” (20). Those controls can include “parameters and attributes related to drug substance and drug product materials and components, facility and equipment operating conditions, in-process controls, finished-product specifications, and the associated methods and frequency of monitoring and control” (20). Development of a control strategy must take into consideration all existing product and process knowledge gained over the course of product development (Figure 4). A control strategy based on the most up-to-date knowledge available will ensure that a biopharmaceutical product is manufactured within specifications set by the process design space. MAb complexity makes necessary a control strategy that can demonstrate the manner in which control over quality is maintained (19). A strong control strategy is essential to securing regulatory approval. CQAs and CPPs included in a design space also must be included in the associated control strategy. The purpose of this strategy is to ensure that that a biomanufacturing process remains in a state of control inside its design space, which will ensure that established quality targets are met. Control Strategy Risk Assessment: A control strategy is based on the risks associated with CQAs falling outside of their established ranges. The level of control or monitoring required is based on the cumulative risk of a CQA range deviation. Determining what that risk is requires a control strategy risk assessment with a cumulative FMEA. Equation 3 shows a potential formula for such a risk assessment from the A-Mab case study published in 2009 (21). Defining a Control Strategy: The CPPs and CQAs categorized and prioritized over the course of the QbD process are essential to defining a control strategy. Knowledge gained through experimentation in process development and characterization will contribute to the rationale for each CPP included in a control strategy. CQAs and CPPs identified by iterative risk assessments and process characterization (and included in the design space) will be included in the control strategy. Elements of a Control Strategy: Elements of a control strategy might include input material controls, specifications, product characterization, in-process controls, process/performance parameter controls, and process monitoring (10). Table 1 describes these elements. A control strategy includes a description of how control over each CQA is maintained. Keep in mind, however, that a control strategy or assay cannot alter the designation of critical or noncritical for an individual CQA. Instead, it demonstrates that parameters affecting that characteristic are controlled (2). Control Strategy Lifecycle: A control strategy should be developed in the early stages of product/process development, as necessary for manufacturing a biologic for all clinical phases. The control strategy is not a static element, however; like all of QbD, it is iterative and tied to the product lifecycle. The strategy should be updated or revised as new product/process knowledge is learned or understanding changes. Increased process understanding gained during commercial manufacturing can allow for improvements to be made, often with no regulatory hurdles, provided that an adequate process design space is in place. Applying QbD in early development provides a strong basis for scaling up a MAb manufacturing process from early clinical production through commercialization. To successfully scale up, it is necessary to understand the factors that can create variations in outcome and use production and control methods that reduce that risk to a minimum. Most development work is performed at the 5-L or 10-L scale, whereas commercial production typically runs at the 2,000-L or even 20,000-L scale, representing up to a 4,000-fold increase. Using QbD to develop a robust process understanding and control strategy, including all available information gathered during development, facilitates transfer and scale-up of a bioprocess. Full process understanding and control require not only process characterization but also full characterization of a MAb itself, using the most sensitive and reliable analytical methods available to identify and control critical process parameters throughout scale up. Regulatory filing follows the definition of a process design space and a control strategy with completion of process qualification. The filing includes detailed descriptions of the product design space, process design space, and control strategy (7, 10, 11, 22). Developers should describe all process controls used to manage each CQA in the control strategy section (5). These regulatory filings can be submitted using the common technical document (CTD) format, a harmonized approach to filing a new drug application (NDA) in all regions that are signatory to the International Conference on Harmonisation of Technical Requirements for the Registration of Pharmaceuticals for Human Use (23). Using the CTD approach to filing eliminates the need to generate multiple documents for different regions. Immediately following approval of a biopharmaceutical product, the sponsor company must begin to continually monitor its manufacturing process to ensure that variability remains within limits defined by the process design space. Using the QbD approach can allow the company to make changes to that process without needing further review or regulatory approval (1). During commercial manufacturing, process knowledge gained can be used to make adjustments to the operating space inside the process design space, which could provide for greater efficiency and reliability. Alterations to the process design space, however, must be validated and approved by the FDA (11). Adequate quality systems are required for oversight of changes made to a bioprocess within its process design space that do not require regulatory approval (7, 10, 11, 22). QbD is an updated approach to pharmaceutical development that has the potential to greatly improve how MAbs are developed. Starting with the end in mind is a fundamental embodiment of QbD that lays out a structure and a path forward for such biologic products as they enter and go through development. 1 ICH Q8(R2). Pharmaceutical Development. US Fed. Reg. 71(98) 2009; www.ich.org/fileadmin/Public_Web_Site/ICH_Products/Guidelines/Quality/Q8_R1/Step4/Q8_R2_Guideline.pdf. 2 Garcia T, Cook G, Nosal R. PQLI Key Topics: Criticality, Design Space, and Control Strategy. J. Pharmaceut. Innov. 3(2) 2008: 60–68; doi:10.1007/s12247-008-9032-4. 3 Chatterjee S. Design Space Considerations. AAPS Annual Meeting: Chicago, IL, 14–17 October 2012. 4 Jiang C, et al. Defining Process Design Space for a Hydrophobic Interaction Chromatography (HIC) Purification Step: Application of Quality By Design (QbD) Principles. Biotechnol. Bioeng. 107(6) 2010: 985–997; doi:10.1002/bit.22894. 5 International Standard 60812. Analysis Technique for System Reliability: Procedure for Failure Modes and Effects Analysis (FMEA). International Electrotechnical Commission: Geneva, Switzerland, 2006. 6 ICH Q9. Quality Risk Management. US Fed. Reg. 71(106) 2006; www.ich.org/fileadmin/Public_Web_Site/ICH_Products/Guidelines/Quality/Q9/Step4/Q9_Guideline.pdf. 7 ICH Q11. Development and Manufacture of Drug Substance (Chemical Entities and Biotechnological/Biological Entities). US Fed. Reg. 77(224) 2012: 69634– 69635; www.ich.org/fileadmin/Public_Web_Site/ICH_Products/Guidelines/Quality/Q11/Q11_Step_4.pdf. 8 ICH Q6B. Test Procedures and Acceptance Criteria for Biotechnological/Biological Products. US Fed. Reg. 64, 18 August 1999: 44928; www.ich.org/fileadmin/Public_Web_Site/ICH_Products/Guidelines/Quality/Q6B/Step4/Q6B_Guideline.pdf. 9 Current Good Manufacturing Practices for Finished Pharmaceuticals. Code of Federal Regulations, Title 21, Part 211.160. US Food and Drug Administration: Rockville, MD, 2013, rev. 1 April 2015. 10 Rathore A. Roadmap for Implementation of Quality By Design (QbD) for Biotechnology Products. Trends Biotechnol. 27(9) 2009: 546–553; doi:10.1016/ j.tibtech.2009.06.006. 11 Roy S. Quality By design: A Holistic Concept of Building Quality in Pharmaceuticals. Int. J. Pharmaceut. Biomed. Res. 3(2) 2012: 100–108. 12 Rathore A, et al. Defining Process Design Space for Biotech Products: Case Study of Pichia pastoris Fermentation. Biotechnol. Prog. 24(3) 2008: 655–662; doi:10.1021/bp070338y. 13 Bozzone S, et al. Technical Report 60: Process Validation — A Lifecycle Approach. Parenteral Drug Association, Inc.: Bethesda, MD, 2013. 14 EMA/430501/2013. EMA–FDA Pilot Program for Parallel Assessment of Quality By Design Applications: Lessons Learnt and Q&A Resulting from the First Parallel Assessment. European Medicines Agency: 20 August 2013; www.ema.europa.eu/docs/en_GB/document_library/Other/2013/08/WC500148215.pdf. 15 Jiang C, et al. Defining Process Design Space for a Hydrophobic Interaction Chromatography (HIC) Purification Step: Application of Quality by Design (QbD) Principles. Biotechnol. Bioeng. 107(6) 2010: 985–987. 16 Steiner S, Abraham B, MacKay J. Understanding Process Capability Indices. Institute for Improvement of Quality and Productivity, Department of Statistics and Actuarial Science, University of Waterloo: Waterloo, Ontario, 1997; www.stats.uwaterloo.ca/~shsteine/papers/cap.pdf. 17 Process Capability (Cp, Cpk) and Process Performance (Pp, Ppk): What Is the Difference? iSixSigma: Ridgefield, CT; www.isixsigma.com/tools-templates/capability-indices-process-capability/process-capability-cp-cpk-and-process-performance-pp-ppk-what-difference/#defs. 18 Elliott P, et al. Quality By Design for Biopharmaceuticals: A Historical Review and Guide for Implementation. Pharmaceut. Bioprocess. 1(1) 2013: 105–122; doi:10.4155/pbp.13.6. 19 Piriou J, et al. Control Strategy as the Keystone of the Product Lifecycle, from Product/Process Understanding to Continuous Process Verification and Improvement. Pharmaceut. Eng. 32(1) 2012; http://aktehom.com/wp-content/uploads/files/AKTEHOM_avis_expert_201202_ISPE_control_strategy.pdf. 20 ICH Q10: Pharmaceutical Quality System. US Fed. Reg. 74(66) 2009: 15990–15991; www.ich.org/fileadmin/Public_Web_Site/ICH_Products/Guidelines/Quality/Q10/Step4/Q10_Guideline.pdf. 21 CMC Biotech Working Group. A-Mab: A Case Study in Bioprocess Development, Version 2.1. CASSS: Emeryville, CA, 30 October 2009; www.casss.org/associations/9165/files/A-Mab_Case_Study_Version_2-1.pdf. 22 Rathore A, Winkle H. Quality By Design for Biopharmaceuticals. Nat. Biotechnol. 27(1) 2009: 26–34; doi:10.1038/nbt0109-26. 23 ICH M4 (R3): Organisation of the Common Technical Document for the Registration of Pharmaceuticals for Human Use. International Conference on Harmonisation of Technical Requirements for Registration of Pharmaceuticals for Human Use: Geneva, Switzerland, 2004; www.ich.org/fileadmin/Public_Web_Site/ICH_Products/CTD/M4_R3_Organisation/M4_R3__organisation.pdf. Corresponding author Brendan Cooney is associate consultant; Susan Dana Jones, PhD, is vice president and principal consultant; and Howard Levine, PhD, is CEO at BioProcess Technology Consultants (BPTC). For more information, contact Al Doig at 1-781-281-1869; adoig@bptc.com.